Over the last decade, the term “esports” has crept ever increasingly into the conversation surrounding video games. A “sport” that emerged from LAN parties in student dorms and garages has grown into a multi-million dollar global industry. 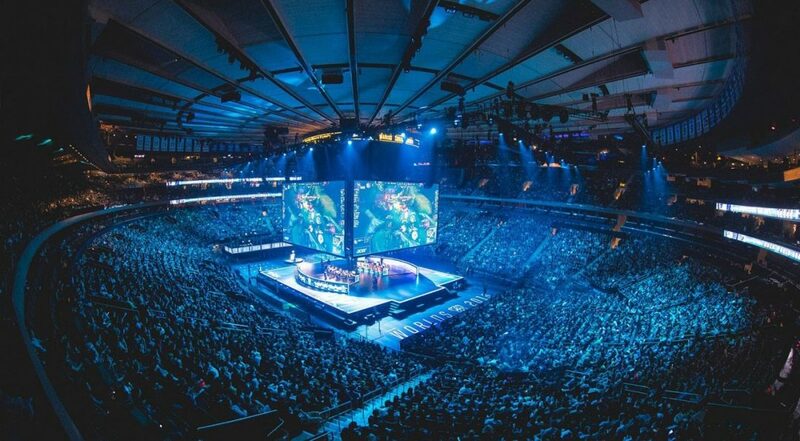 According to esports analysis site NewZoo.com, the esports industry is on the verge of breaking the billion-dollar mark in revenue as early as next year and is projected to be worth $1.4 billion by 2021 with a majority of income being generated by brand sponsorship, which currently accounts for 40% of the industry’s income. However, the esports phenomenon remains in shadows away from the glare of the mainstream despite consisting of approximately 165 million enthusiasts and 215 million occasional viewers worldwide (figures sourced from NewZoo’s 2018 Global Esports Market Report). Its underground status is partly explained by the audience’s behaviour and global location, but it now seems inevitable that esports will move out of left field on the global stage as it adopts the practices of traditional sports and the industry sets its sights on becoming fully professional within the next five years. While nearly any video game can be played competitively to some degree, the definition of an actual esport remains somewhat fickle. Even a multi-player game with the astronomical success of “Fortnite” is not officially considered an esport by Twitch, which has emerged as something of a gatekeeper for the classification of esports. Instead, titles such as “Overwatch”, “Dota 2”, and “Counter-Strike: Global Offensive” dominate Twitch’s official esports watchlist. Indeed, the Twitch channel for Riot Games’ hugely competitive MOBA (Massive Online Battle Arena) “League of Legends” became the first channel to break the one billion viewers mark on the platform last Sunday, further proving the ever-growing nature of the esports audience. It is almost inconceivable that something of such immense popularity remains out of sight in the mainstream media. But by examining the makeup and location of the esports audience, we can see why esports is the very definition of a “future audience”. 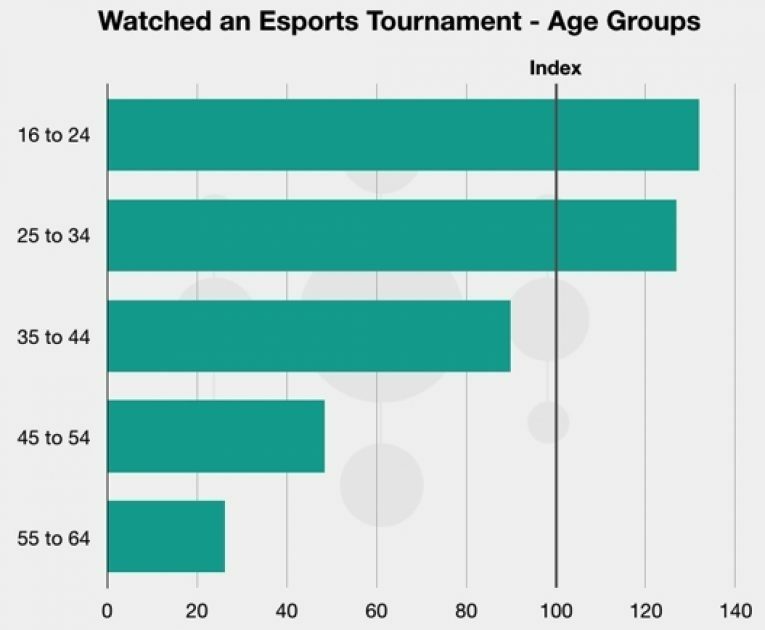 While both 16-24-year-olds and 25-34-year-old gamers dramatically over-index in engagement with esports tournaments, this drops off sharply with older gamers, who are far less likely to watch esports. It would be an exaggeration to say that esports is a pursuit exclusively for millennials but they are undoubtedly driving the growth in popularity and should be the target audience for any brands looking to utilise the exponential marketing opportunities presented by esports. 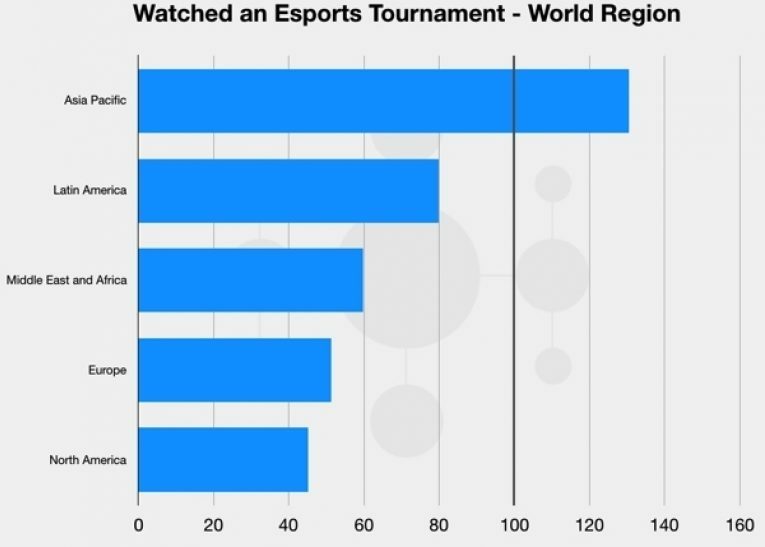 It is not surprising to see Asian territories markedly over-indexing for viewing esports since it is the region attributed with popularising the format; however, the key video game markets of Europe and North America are drastically under-indexing on viewership for esports. With the rise of game streaming on Twitch and YouTube, it is apparent that the potential for growth of esports’ audiences in those two regions is massive. Strangely though, esports fans are not as rooted in digital as one might expect. One of the most surprising revelations in Global Web Index’s 2018 Esports Trends report is that esports fans actually spend longer watching linear/broadcast television than the online equivalent. 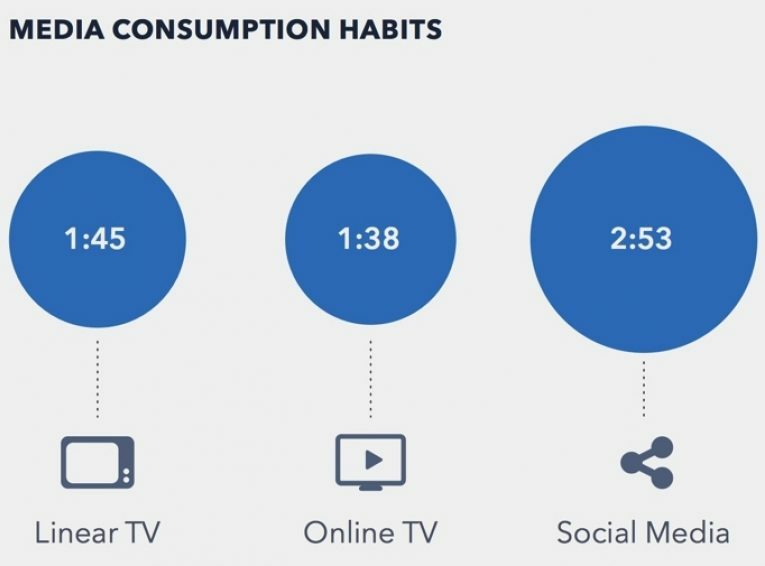 Having firmly established that the primary esports audience consists of millennials, who are largely attributed with driving the cord-cutting trend towards online-only TV, and esports having a profoundly digital origin, it is slightly perplexing at first to see that esports fans watch seven more minutes of linear TV a day than online TV. This could be explained, however, by esports fans also being fans of traditional sports. As noted in the same GWI report, 9 out of 10 of the esports fans also watch at least one of the 31 sports tracked by GWI. With live sport being one of the last bastions of broadcast television, this presents a rare opportunity for linear television to get the drop on its encroaching online counterpart with a growing future audience. This opportunity could come fully to fruition at the 2020 Olympics in Tokyo where esports could make a debut as an event. Although this eventuality is far from certain due to Japan’s strict gambling laws prohibiting “paid video games events”, there are plans afoot to make exceptions in the laws to allow esports into the Olympics two years from now. Even if esports fail to materialise at Tokyo 2020, it seems a near certainty that it will be included in Paris 2024. Again, this is further proof of esports teetering on the edge of the mainstream and it would be extremely prudent for broadcast television to start presenting esports content to harness a future audience which is unusually still more engaged with traditional television than online. While the sheer volume of the esports fans present massive opportunities for brands to reach a rapidly growing audience, esports viewers are quite particular in how they engage with advertising. We can see above that esports fans prefer brands to conduct their outreach organically, particularly via influencers such as celebrities and ads that appeal to their personal interests. 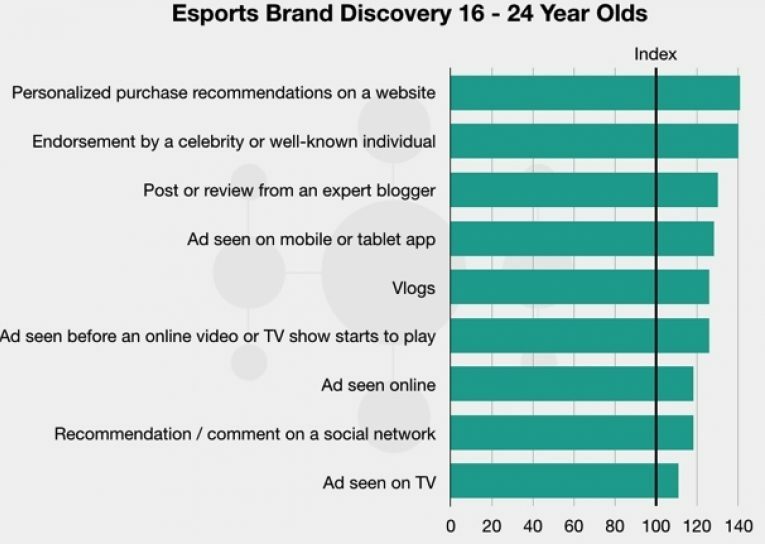 They also favour peer-to-peer advocacy of brands and products with esports fans in the 16-24-year-old demographic 24% more likely than an average 16-24-year-old to promote a product based on their friends’ interests. They can be a difficult audience to reach, however, with 9 out of 10 esports fans using ad blockers, private browsers, or deleting cookies according to GWI’s Esports Trends report. A more personal outreach strategy will be vital for brands looking to engage with the esports audience since it is an audience relatively immune to mass advertising. Utilising sponsorship of esports players, precise ad targeting, and harnessing prominent influencers within the esports community should be the best way to prompt brand engagement with esports viewers, who could prove to be valuable brand advocates given their propensity for p2p recommendations among the burgeoning audience. As the esports scene continues its march towards the mainstream and seeks to establish itself alongside traditional sports by becoming fully professional, it is becoming increasingly important for brands to understand the behaviours, preferences, and interests of a future audience that is already here. If you're interested in learning more about the Audience Intelligence solutions we offer here at EntSight then take a look at our website or drop us a message here.